In what is likely to become a continuing series here at The Cigarmy, I’m happy to shine the spotlight on another enterprising artist within the cigar world. The gentleman pictured to the left is Scott Hicks. I met Scott quite by chance in a McDonalds during IPCPR last week. We struck up a conversation based on our shared support of Cigar Rights of America (thanks to CRA lapel pins), and soon found we had a number of other common interests as well. Scott is a budding artist, and produces beautiful stoneware ceramic ashtrays. A military veteran, he has a strong support of our armed forces and a vibrant enthusiasm for the world of premium cigars. After leaving the military, he went back to college and during the course of his education, he pioneered the process to embed silhouetted logos into ceramic which you see in the pictures below. 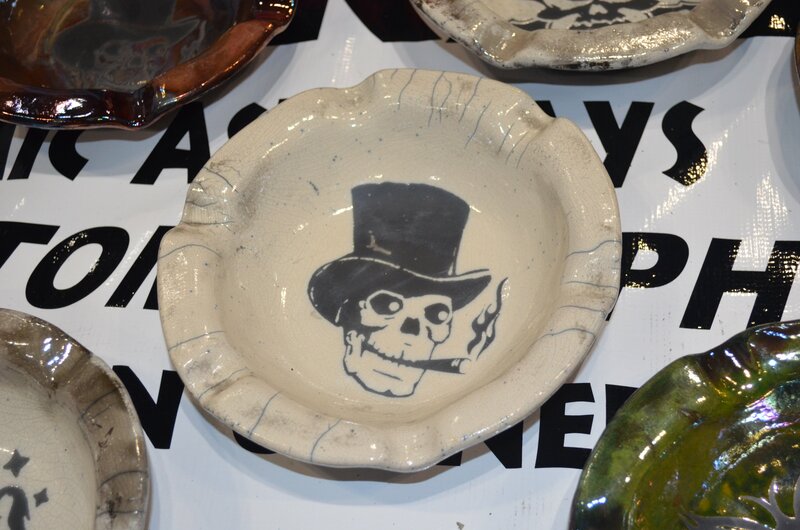 He is now marketing his creations as Rogue Ashtrays. Each Rogue ashtray is handmade of clay, and through the magic of organic glazes and kiln-firing each displays a unique pattern of coloration and iridescence. They can be customized with your own logo or artwork with a minimum wholesale order of 6 ashtrays and a nominal setup charge. The only requirement graphically is that you furnish a black on white background or black on copper background logo, in vector graphics format or vinyl cut decal. Please note that you must own or have written permission from the copyright holder in order to have copyrighted images embedded in your ashtray. 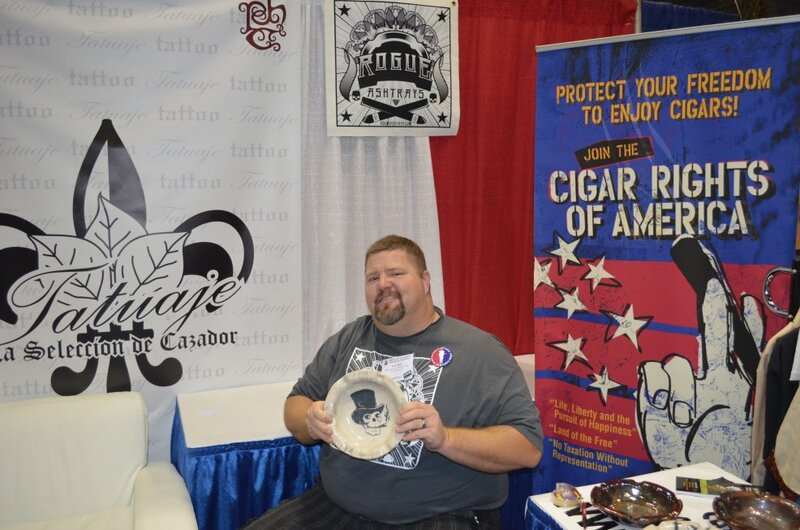 Scott credits Pete Johnson of Tatuaje as a great encouragement, and displayed some of his creations alongside the Tatuaje booth at IPCPR this year. MSRP on stock ashtrays is $60, and Tatuaje branded ashtrays retail for $80 – with $10 of the price going to Cigar Rights of America. Wholesale orders of 6 or more are welcomed, and you can find more information at Scott’s Webpage, or directly by email to: [email protected] I am the proud owner of the white ashtray pictured above with skull graphic…and plan one day soon to have some produced with The Cigarmy logo as well (look for a few of those to make it into future giveaways once they’re made).